Aging adults tend to eat fewer calories, due to decreased appetite and activity levels. This decrease in caloric intake can also lead to deficient levels of vitamins and minerals. 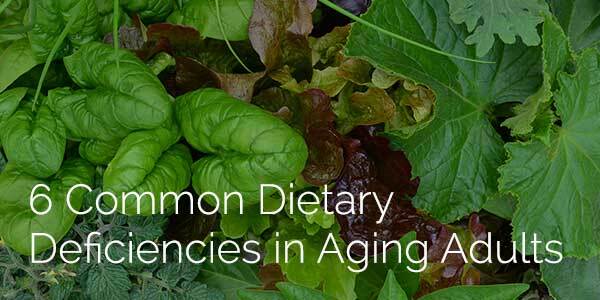 These dietary deficiencies have been linked to chronic diseases such as: heart disease, cancer, and osteoporosis. What vitamins are the most important for maintaining a healthy life? Calcium—important for bone density and strength, calcium is found in dark leafy greens and dairy products, as well as calcium-specific supplements. Calcium deficiency can lead to decreased bone density, lowered mobility, and falls. Vitamin D— this vitamin works in conjunction with Calcium to promote bone health and strength. Vitamin D is naturally absorbed by the body through sunlight, but can also be found in certain types of fish and fortified foods like orange juice or milk. Magnesium—this mineral plays a part in many body processes like glucose and blood pressure regulation. Magnesium is found in many plant and animal food sources, especially dark leafy greens, nuts, seeds, and whole grains. Vitamin C—this vitamin plays a role in the absorption of proteins, as well as the creation of connective tissue, which is vital for wound healing. Vitamin C also contains antioxidants that may help fight diseases like cancer. Brightly colored fruits and vegetables are the best sources of Vitamin C, like citrus fruits, tomatoes, and bell peppers. Vitamin E—the antioxidant qualities of Vitamin E allow it to combat disease-causing free radicals. This vitamin also supports immune system functioning. Vitamin E can be found in nuts, seeds, and vegetable oils. Vitamin B6— B vitamins perform many functions in the body, primarily supporting protein absorption and cognitive function. The richest sources of B vitamins are fish, organ meats (like liver), potatoes, and other starchy vegetables. Aging adults should consider lowering their intake of saturated fats and sodium, and increasing fruits, vegetables and whole-grain products. A doctor may recommend specific supplements or foods to help ensure proper vitamin intake. Consult your doctor before making changes to your diet or supplement routine.